Maneka Gandhi alleged that BSP members who bought party tickets, are "musclemen" and they would eventually extract the money from the common people. Maneka Gandhi accused Mayawati of not being loyal to anyone. 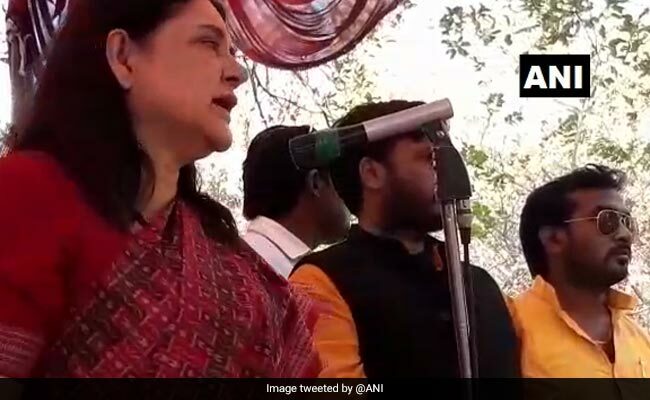 Union Minister and BJP candidate from Sultanpur Lok Sabha constituency Maneka Gandhi has described BSP supremo Mayawati a "merchant of tickets" and accused her of of selling party tickets for Rs 15-20 crore each. "Everybody knows Mayawati sells party tickets and even her party members take pride in telling this. She has 77 houses and residents of those houses say with pride that Mayawati takes Rs 15-20 crore either in diamonds or in cash," she was quoted as saying by news agency ANI on Wednesday. "I ask these armed men that from where they get Rs 15-20 crore for giving it to Mayawati? They would eventually extract Rs 15-20 crore from the common people," she said. The Union Minister also accused the former Uttar Pradesh chief minister of not being loyal to anyone. "Mayawati does not spare her own partymen then how will she spare the country and the state. She can't do without (currency) notes. She does not give her party's tickets to anyone without taking money. Mayawati is a saudaagar (merchant) of tickets," she was quoted as saying by news agency PTI. "Mayawati is not loyal to anybody (Mayawati kisi ki nahi hai). Her (party's) ticket cannot be obtained without currency notes," she alleged. In 2016, two BSP MLAs accused the party leadership of demanding "huge sums" for allotting tickets for the 2017 UP Assembly polls, prompting the party to suspend them hours after they levelled the allegation. The lawmakers -- Palia MLA Romi Sahni and Mallawan MLA Brijesh Verma -- later joined the BJP. Polling in Uttar Pradesh will be held in all the seven phases of the Lok Sabha elections from April 11 to May 19. Counting of votes will take place on May 23. While Maneka Gandhi will contest from Sultanpur, her son, Varun Gandhi, will be contesting from Pilibhit.